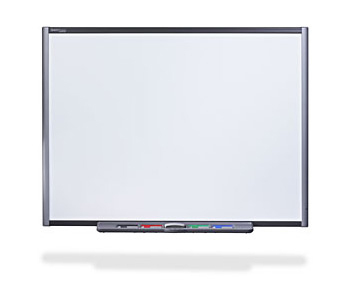 Smartboard is a leading brand with the ever popular SB680 or the excellent value SB480. The main operational difference is that the SB480 does not have a pen tray. However it is the same size and would be used in the same way. Front projection SMART Board interactive whiteboards provide the most popular solution for classroom applications with a choice of 4 screens sizes available, largely dependent on the number of students, classroom size and layout, plus of course budget. SMART Board interactive whiteboards engage pupils’ different learning styles, whether visual, auditory or kinaesthetic. Similarly with special educational needs pupils can simply touch the surface to manipulate objects without the fine motor skills required to operate a mouse or digital pen. All front projection SMART Boards feature intuitive touch screen capabilities which allow you to write, erase and perform mouse functions with your finger, or a pen. No proprietary pens or tools are needed, eliminating any down time in the event of a pen going missing. Incorporating a durable hard coated polyester surface SMART Boards are optimised for front projection and supported by SMART’s 5 year parts and labour warranty * upon product registration within 90 days of purchase. SMART Board software is the award winning software suite that powers SMART Board interactive display products. Software upgrades are free for licensed users and easy to download, so you’ll always have the latest functionality. A typical classroom fit-out comprises various types of hardware and their associated installation and integration, all of which can be provided as a turnkey solution or indeed separately. We may also be able to incorporate existing equipment which you may already have and we will be happy to advise accordingly. In its simplest form there are three necessary hardware elements namely (1) the SMART Board itself; (2) a computer; and (3) a multimedia projector (native XGA resolution, 1600 ANSI lumens brightness and a 3 year product & lamp warranty recommended). Next you’ll need to consider how the system is to be installed. If the resource is dedicated to a particular classroom we’d recommend a fixed installation whereby the SMART Board would be wall mounted; the projector would be ceiling mounted with all cables discretely concealed and terminated to a clearly labeled input panel. Alternatively mobile trolleys are available where the resource needs to be shared and moved between classrooms. You should also consider programme sound and whether audio amplification is required. Increasingly many teaching resources have supporting soundtracks which require amplification so that the whole class can adequately hear the broadcast. Likewise many of the free flash resources available in the ‘Gallery feature’ have supporting audio which requires amplification. Similarly at some point you’re likely to want to attach sound files to resources you’ve created yourself which would require amplification. And finally with internet access now broadly available in most Irish classrooms, simply connect your computer to the network and SMART Board software offers infinite possibilities to create teaching resources and supporting activities.